I'm not desperate, was just curious. 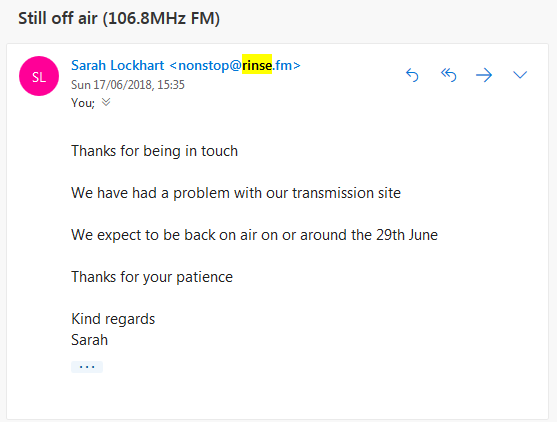 Makes sense now, only listen to Rinse once a week for one show, and at first thought my radio was playing up, then thought another closer or more powerfull station was causing issues. Wonder whats really up? And Albert H love that post, quality. I just wait for the podcast of Uncle Dugs. The webstream sound quality is the pits. I think Dugs is one of the original DJ's from Rinse 91.8 back in 1994, he did leave and go on Kool about 10 to 15 years ago but is back on there. 91.8 I don't remember them on that only 1003 /1004 I only remember passion 918 how long were they on there? Rinse is also on DAB+, but on a multiplex that is weak. I remember it well, they only played Jungle. Last edited by teckniqs on Wed Jun 20, 2018 11:34 pm, edited 1 time in total. As far as I was aware, Conflict FM was some of the old Unity crew from the same blocks in west Essex near east London. I couldn't get it out in Surrey where I lived because of 88.5 BBC Radio 2 Hampshire, but I heard it a few times when I went over Woolwich area around 1995 playing Jungle, signal was strong there. I didn't post that 2011 video to explain to you why it's gone off air, it was just a nice piece of history and I thought I would share it. I posted the wrong video up by mistake. .....It was supposed to be the Geenius one, not Butterz. The right video is in my post above now.